When God commands us to love our neighbor, he is not instructing us to love what he hates. No, we assume that God tells us to love our neighbor because he loves our neighbor. Jesus uses this very logic in the Sermon on the Mount. Why should we love our enemies? God the Father does it. If God loves his enemies, we can be sure he loves our enemies too. God loves even those who are hateful to him in behavior and character by showering them with mercy. No one is authorised to hate those whom God loves. We are to love everything and everyone God loves. Jesus chooses the category of enemies to extend the borders of our love beyond those we would ordinarily and naturally love. The parable of the Good Samaritan is given to explain who a man’s neighbour is, and since the ‘neighbourly’ man was the racial, ethnic and religious opposite of the wounded man, Christ’s implicit definition of neighbour is the person most alien to you and everyone in-between. The one furthest from you religiously, economically, or ethnically is your neighbour, and every other human between you and that furthest one. The person most likely to be your enemy is your neighbour, and you are to love him. If someone is part of the human race, you can love them as someone God loves. We are to love what he loves. We know this principle. If you want to bless someone who is a parent, do something kind for his or her children. Love done to the one you love is counted as love toward you. In a passage related to judgement, Jesus shows how he will regard love for those he loved as love for himself. Just as we can love our neighbor for God’s sake by seeing God’s reflection in him, and by submitting to God’s commands, so we can enjoy God’s beauty in our neighbor by aligning our delights with God’s. Loving God in this way means finding pleasure in God’s pleasures, delighting in what God chooses to delight in, or finding beauty in what God finds beautiful. This will certainly challenge our low visions of God. Since we think of God as loving that which is best, how could he possibly love those we find unlovely? By submitting our loves to God’s, we expand our understanding of God. God is apparently able to love and hate simultaneously: as he finds in his human creature vestiges of beauty, he loves; as he finds distortions and perversions, he hates. And yet mercy triumphs over justice, as God seems to tirelessly work towards beautifying what is broken, and after countless rejections and suppressions of truth does he finally gives a creature over to its ugliness. We will never come to this deeper and richer communion with God, unless we deliberately embrace his loves as our own by faith. We may not understand them at first, but by imitating God’s delights, we enter into the heart of God, and break out of the hardened shell of our selfish prejudices. Think of the shock and surprise of God’s people to learn that Jesus loved a repentant but nevertheless notorious woman (Luke 7:37-50), a Samaritan (John 4:1-42), an untouchable leper (Matthew 8:1-3), a Gentile woman (Mark 7:24-30), and traitorous Jewish tax collectors (and their dubious friends) (Luke 5:27-32, 19:1-10). Responses to Christ’s loves ranged from shock to incredulity to disgust. But once the disciples had died to their pride, and yielded to what God loves, they were new men. Ananias had to lay aside his prejudice against Saul and trust that God loved him to experience more of God (Acts 9:10-18). In making the pleasures of God our own, we come to a much deeper understanding of God. Indeed, when we delight ourselves in the Lord, he gives us the desires of our heart, which is as much as saying, find pleasure in what pleases God. God’s project of beautifying the beloved is pleasurable both for the task, and for what it reveals of the Artist himself. How convicting it is to find that God loves ones we hate! How convicting to discover that some of the traits in people that we love God finds detestable! 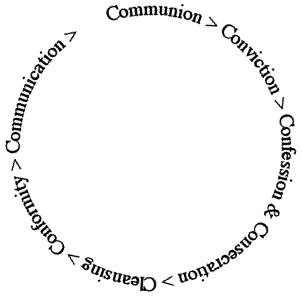 Arising from this conviction should be confession, and consecration of our loves, leading to cleansing and more conformity, and a deeper communication of Christ to us.